The antagonist, smart and strong leader but ruthless, he fights hard against the Confederate defences and literally cannot bypass their defences until a massive siege tank bombardment, and over the towering rubble of the outer defences the bombardment kills many innocent lives and Lieutenant Curtis Hollin plans to hunt the General down and butcher him and make him pay for his crimes. A Three-Star General? In Wikiedia said that the Generals of this kind are known as Lieutenant General. I never really read that I just called him Three Star. Thats just the name i decided to give him. Wikipedia isnt right about everything too. Well, that is all the same. While the campaign is okay (in this case, it is) we are not going to begin to discuss because of the military rank of a character. I finally got to play your campaign, it is fun. I especially like your plot at the character of Curtis Hollin. +story: great captivating story, superb intro! +design of the bases: I liked how the bases are set up. -minor logic issues: Why could the Grest commander promote Curtis? He is not in the same army, and not his supervisor, not even allied. The explanation with the adamantium does not sound plausible, somehow they must be prevented from functioning (coverd by isolating material, sent into the star of the solar system, you name it). How about once a signal is sent, it is too late? -major logic issue: Why does the Grestian base have a "Son's of Korhal" sign in the upper NW corner? Even if they plan to betray Curtis Hollin and hte Confederacy, they would not put up Son's of Korhal insignia so openly (or at least Curtis should comment on them). +interlude idea: works out great, especially this coming back to the current battle with the sounds of the battle going off. +Dialogue: I like Curtis rebuffing the General even though he is surrounded by enemies. -timing of zerg comment: The conversation about zerg only came up when I found the base in the SW, however, I have killed a few zerg before that. It would have been more logic to activate it with the first killed zerg. +subplot: In principle, I love maps with sup-tasks, and I am sure this map would be great, somehow in my case the triggers got activated in the wrong way. -CRITICAL: Once I build my base in the SW corner as specified, it appeared all other triggers got off simultaneously. the ghost team got set, but I could not move it, as they where transferred to white very fast, and then the red played had common view, and finally I did not have any troops at all under my control. +powerful speech: great speech from Curtis Hollin. +story: events fit in very nicely with origjnal campaign, purification of the planet by Tassadar's fleet. Finally the role of the watcher from the early missions makes a lot of sense. I liked that part. -cinematic sequence: I could not see anything other than the minerals, and also there was a long delay within the sequence. -end of campaign: I agree with Revan that Mission 7 would have been the perfect moment to end the campaign. This mission does not add to the plot. The main strength is your lead character Curtis Hollin, he is very vell done, his dialogues are witty, and his story is captivating to a point that you actually continue playing the missions despite having planned to stop before. That is a big plus. Other positives are the terrain in general, and some of your ideas for the missions. Downsides include one critical error that prevent successful map completion, and a few minor points such as the actual implementation of your concept ideas, some logic issues, and the IMO unnecessary continuation after mission 7. I congratulate you to an interesting campaign. EDIT (05/07/08): included the remaining missions into the review. Last edited by Jadefang on Sat May 10, 2008 8:29 am, edited 1 time in total. I can answer to that, Jadefang. You see, what you say begin to happen since the start of the countdown timer, and is because in the triggers Marine puts to at least rather than at most. I've got Legacy of a Warrior 1.1. I'm not sure if Marine ever released 1.2 or not, but if he did, I don't have it. Also, I'm not sure if he had a mod or not, but I can't find one that would seem to be obviously tied to the campaign, so I assume not. I may just be the worst re-uploader ever. Also, once again, not the original .zip. 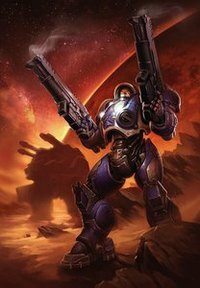 I just found a Legacy of a Warrior 1.1 folder in the StarCraft/Maps/Campaigns folder on my old hardrive and rezipped it, so I can only assume that I've got everything.